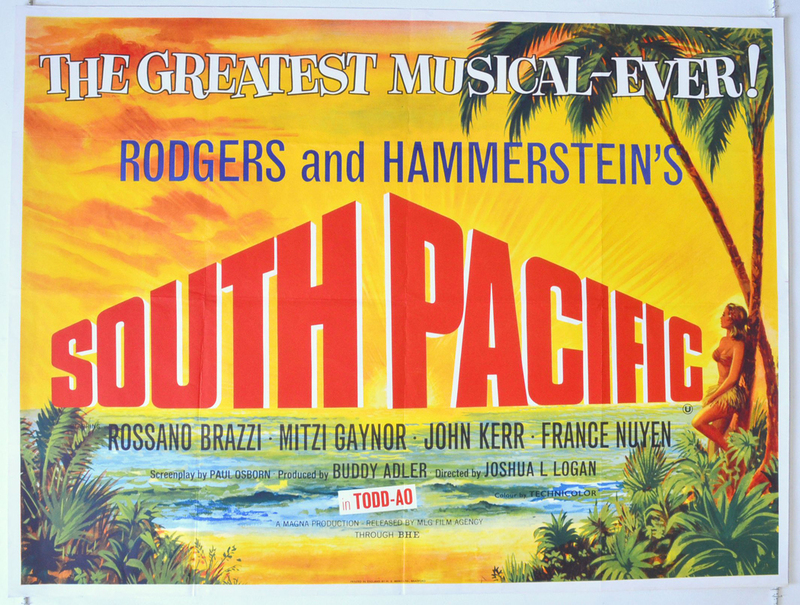 Edited by Thana Skouras and designed by John de Cuir and Dale Hennesy, The Tale of South Pacific was published in 1958 in promotion of the Rodgers & Hammerstein musical. The Tale of South Pacific is a beautiful book. 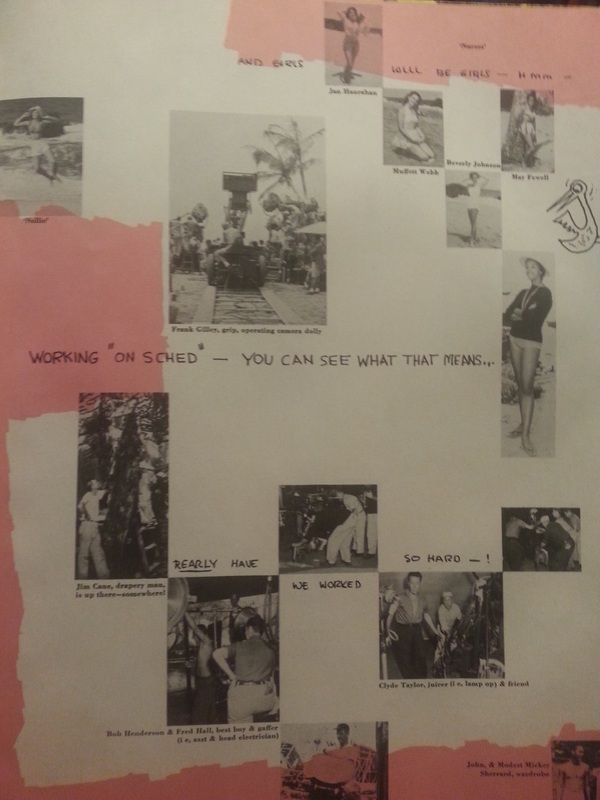 The inside covers in both the front and back list the awards that have been won by South Pacific and its cast/crew (both the play and the film). In general every single page of the book is beautifully designed. The colors are bright, the fonts catch the eye and the illustrations are very fun to look at. An introduction by James A. Michener, writer of the book that served as source material for both the play and the film, tells the story of how Michener wrote the book based on his own experiences. Stationed on an island during the second World War, Michener discovered that some of the officers on the island had set up a night club, and his time on that island inspired his book. Clocking in at a very short 65 pages, The Tale of South Pacific packs in a surprisingly large amount of information. Before digging into the film, the story behind it must be told, so “The Deed” (written by New York Times drama critic Brooks Atkinson) and “In Song and Story” discuss the conception of the original Rodgers and Hammerstein musical play. The sections that follow all have to do with the film alone. The studio, continuity, cast, direction, score, color, camera and art direction are all briefly discussed. The section on continuity is one of my favorites in the book. 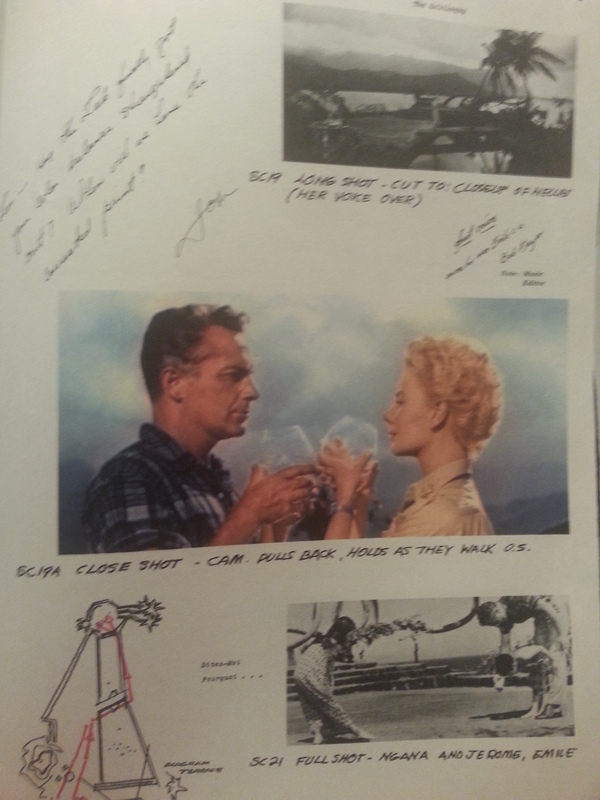 A series of screen captures is accompanied by hand-written notes regarding shot styles, filters and lenses to be used and voice-overs that will play over certain scenes. This section really allows the reader to understand how many tiny bits and pieces go into perfecting a film, and the fact that the hand-written notes come from multiple people show off the film’s expansive, collaborative spirit. The section on art direction is, unsurprisingly, the most visually-appealing in the book. It’s comprised almost completely of illustrations, with a six-page break in the middle for behind-the-scenes and press photos. 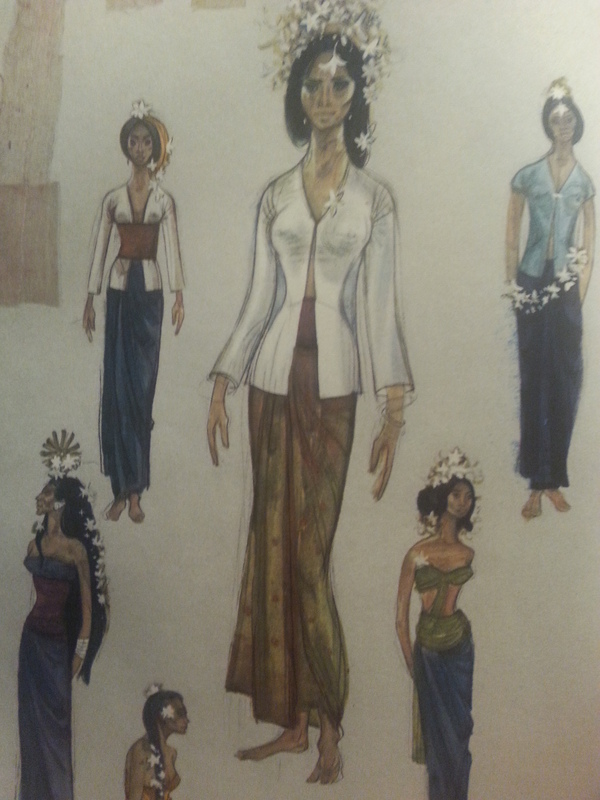 These are absolutely beautiful, especially on the costumes page. Another favorite section follows the art direction: cast biographies. Typical career and lifestyle information is included for each cast member, but what makes this section so great is that it includes quotes from some of the actors about their characters. Rossano Brazzi shows a deep exploration of his character, stating that he thinks Nellie is truly Emile’s first love, though Emile is forty years old and was married once before. This gem of a book can be hard to find, but you may be able to track down a copy on eBay or at an antique shop. I was lucky enough to find a mint copy at my library’s book sale. 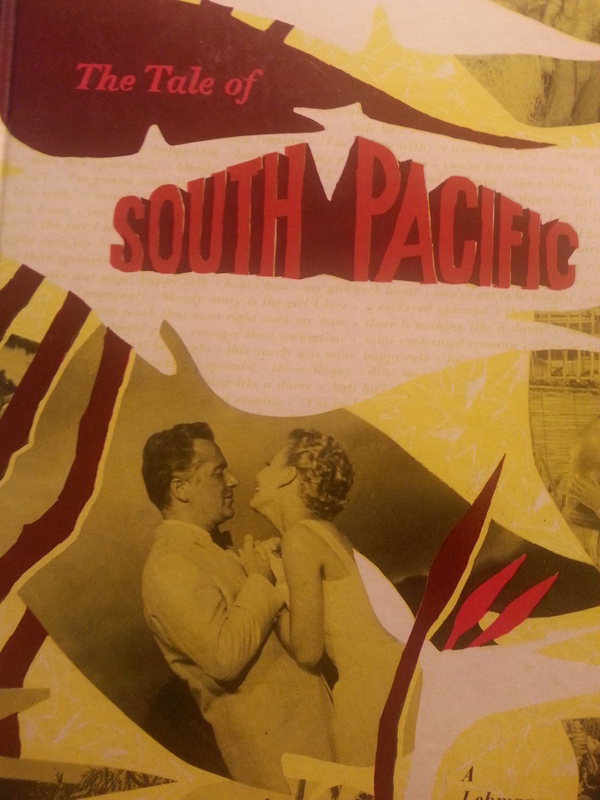 The Tale of South Pacific is a real bundle of eye candy. It provides a somewhat lower level of detail than other books of its type (like one on Ben-Hur that I’ll be reviewing next month on TMP), but’s a quick, interesting read, and a great book for any fan of the film to own. Cool! I was really lucky (and surprised) to come across this and the Ben-Hur book in the same day. Someone with a collection of movie books must have donated them to the library. Fun little reads. That’s wild – she has the Ben-Hur one too! I Love this Musical,& the Music is Wonderful!!!! South Pacific was my favourite musical when I was a kid, I was a little bit in love with John Kerr. I actually re-watched it recently and I wasn’t sure about the use of the colour filters – it looked a lot less magical than I remembered. That said, it’s still visually spectacular, this book looks like a wonderful tribute. I’ll keep my eyes peeled for a copy!